List of Jon’s fly fishing articles The July/August 2017 Issue of California Fly Fisher has his article that’s a written version of the presentation, including images of the flies he uses. For February’s meeting we welcome master guide Jon Baiocchi of Baiocchi’s Troutfitters. 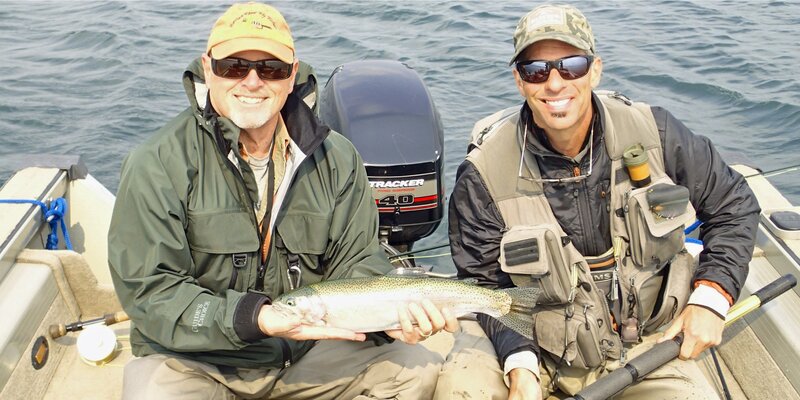 Jon has been fly fishing and tying flies since 1972, and is a California licensed fly fishing guide, published author, educator, innovative tier, and an award winning public speaker giving fly fishing presentations to clubs and expos across the state of California, and Nevada. Jon serves on the Truckee Trout Unlimited Board of Directors, and also volunteers his time with the South Yuba River Citizens League. Born in San Jose, Ca in 1965, his Dad moved the entire family to Paradise, Ca in 1967 to be closer to prime fly fishing venues, and to raise his family in the spectacular forests of Northern California. Jon’s Dad, Bob Baiocchi, was inducted into the Federation of Fly Fishers Hall of Fame in 1999 for his peerless conservation work, and was a major influence in helping Jon hone his fly fishing skills at a very young age. After finishing high school, Jon opted out of college to pursue a career as a professional snowboarder, competing at a national level, starring in feature movies, and working with manufacturers in their research and development programs. After his career ended in 1993, Jon focused entirely on fly fishing and conservation, and learning even more of the intricate details of his home waters. Jon now owns and operates Baiocchi’s Troutfitters guide service In Northern California where he has been guiding for the last 20 years. He has a reputation as a very hard working guide that’s been trained by some of fly fishing’s best known anglers and guides, both past and present. His enthusiasm for the sport is contagious, and combined with his simple approach to teaching gives students the skills needed to be successful on all types of water. Moved by all things flora and fauna his passion for such is never ending. Sharing the knowledge with others is of the greatest importance to him now, and too see others progress, and reach the next level in fly fishing fulfills his life. It’s the legacy his father left him, and a cherished tradition that Jon will continue in his honor. His locations for guiding include Lake Davis, the Wild & Scenic Middle Fork Feather River, Frenchman’s Reservoir, the North Fork Yuba River, The Big & Little Truckee Rivers, The Lower Yuba River, and many secluded creeks in Eastern Plumas County. Jon’s philosophy on fly fishing is to keep it simple, be confident in your presentation, and have fun. Jon has an all new PowerPoint program that was especially created for numerous fly clubs looking for a more technical program on fishing the dry fly. “Mastering the Dry Fly” entails a brief history of the dry fly and those anglers who were involved from the beginning, simple to complex presentations, understanding rise forms, approaching water structure, tips & tricks, and Jon’s favorite patterns for eager to educated trout. Beautiful images and new detailed animated slides provide the audience with clear and concise information for future endeavors on the water while dry fly fishing. This will be a program you do not want to miss!